Welcome aboard HMAS Cerberus, the Navy's premier training establishment. About 6000 personnel are trained annually, averaging 800 trainees onboard at any one time. The establishment covers 1517 hectares and is 70 kilometres from Melbourne near Crib Point on Hann's Inlet, Western Port Bay. Purchased in 1911 and called Flinders Naval Depot, it was commissioned as HMAS Cerberus 10 years later. 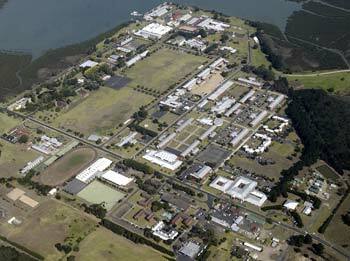 It comprises numerous training and recreation facilities, two chapels, small marina and attractive grounds. The primary role of HMAS Cerberus has always been Navy personnel training. With the establishment of four tri-service schools over the last 13 years, this role has been extended to training Army, Navy and Air Force personnel. Despite change, the charm of HMAS Cerberus remains. Its historic presence, heritage buildings, chapels, sports facilities and gardens create a pleasant training environment. Navy-specific training includes School of Survivability and Ship Safety, which specialises in firefighting, damage control and nuclear biological chemical defence, seamanship and weapons training. 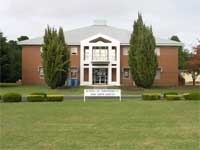 HMAS Cerberus is also the home of the Recruit School and, for all sailors, their first contact with life in the Navy. The site for HMAS Cerberus was recommended by Admiral Sir Reginald Henderson KCB RN after an extensive search of the Australian coastline for suitable locations for major Naval bases. He proposed that a base be established on Hann's Inlet between Sandy Point and Stony Point on Westernport Bay. The base was to include a Torpedo School, a Destroyer Base and a Submarine Base, and be capable of accommodating up to 2000 personnel. The site, covering over 1500 hectares (nearly 3600 acres), was purchased in 1911. The first sod was turned in 1913. The old wharf and hospital were erected first, followed by A, B and C Blocks. The Wardroom, Warrant Officers' Mess, Captain's and other Officers' residences were built between 1915 and 1917. The Drill Hall, Gunnery School and Torpedo School (now part of the Technical Training Centre) were established in 1917 at the height of building activity. The power house and other residences were built between 1918 and 1920. The base was officially opened in September, 1920, under the command of Commander FC Darley RN. 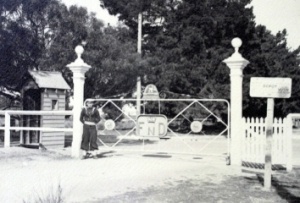 The idea of using it as a Fleet Base was soon abandoned and it became known as Flinders Naval Depot in 1921. The Depot was commissioned HMAS Cerberus on 1 April that year. Royal Colours were first presented to HMAS Cerberus, on behalf of His Majesty King George V, by the then Governor-General the Right Hon John Lawrence Baird, 1st Baron Stonehaven, GCMG, DSO, PC, JP, DL, in 1927. They were the first Royal Colours to be presented to an Australian Naval Unit. The Queen's Royal Colours were presented in 1954 by His Royal Highness The Duke of Edinburgh. Royal Colours incorporating the Southern Cross were later presented by Governor-General Lord Casey in 1968. The present Royal Colours were presented by Her Majesty Queen Elizabeth II in 1986. 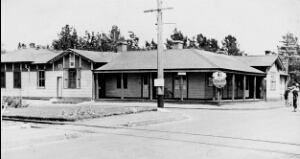 In 1930, during a period of Naval retrenchment, the Royal Australian Naval College moved from Jervis Bay to HMAS Cerberus, where it remained until 1958 when it returned to Jervis Bay. The outbreak of World War II found the facilities inadequate to deal with the needs of wartime recruits who were passing through Cerberus at the rate of 400 a month. Temporary buildings were erected to cope with the needs of this sudden influx. Our Lady Star of the Sea Chapel. The first WRANs arrived in 1942 and, apart from a short post-war break, have been part of the RAN ever since. 1942 also saw the introduction of an Officers' Training School to train selected recruits as officers for war service. The school trained 1000 sailors during the war and closed in 1945. There have been many changes to since the war. Progressively, many of the temporary buildings have been dismantled and replaced. The Roman Catholic Chapel, Our Lady Star of the Sea, was opened in 1948, followed by St. Mark's Chapel in 1954. Other additions include the present accommodation blocks, cinema, Senior Sailors' Mess, Club Cerberus, Gymnasium and Aquatic Centre, Seamanship School and Wharf, Communications School, Recruit School and Health Centre. The phasing out of apprentice training, the closure of HMAS Nirimba and the introduction of Tri-Service training has resulted in many changes at HMAS Cerberus. Upon graduation from Recruit School, Recruits will be promoted to Seaman Star and undertake training at their respective category school. Whilst under training, trainees will be divided up into small groups of about 12 - 20 people known as a Division. They will study together and take lessons together, and form great friendships that last throughout their naval careers. 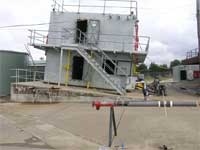 The RAN School of Survivability and Ship's Safety is an actual mock-up of a ship structure designed to teach students (under direction of highly qualified senior staff) to work in teams to attack and fight onboard fires. Countersink is designed to teach students (under direction of highly qualified senior staff) how to combat floodwaters in compartments and ruptures in the hull caused by attacks from missiles or torpedoes. Students also undergo training in combating Nuclear (radiation), Biological and Chemical Defence (NBCD) attacks. The Seamanship School is the lead authority for all seamanship, corrosion control and survival training for Officers and Sailors alike. 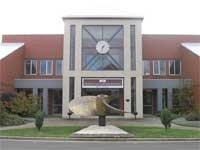 The School is also responsible for the delivery of Shipbourne Lifesaving, Survival Equipment Maintenance, RAN small boat Coxswains' and Certificate II Surface Finishing courses. A fully enclosed Demonstration hall houses large scale models designed specifically to support key training activities ie. replenishment at sea, berthing. The Engineering Faculty is the largest training section within HMAS Cerberus. Both Electronics Technical (ET), and Marine Technical (MT) sailors undergo both their Initial Technical Training and Advanced Training within the faculty. The faculty houses a vast array of full size working pieces of equipment, from a gas turbine to an ice machine. 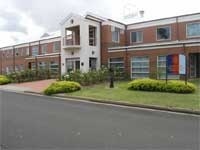 The Defence Force School of Signals - Maritime Communications and Information Systems Wing, is housed in a purpose-built training facility. Courses include flag signals, typing, terrestrial and satellite radio, data security and message encryption. The Supply and Health Faculty provides a comprehensive array of courses ranging from initial employment training for Cooks, Stewards, Writers, Stores and Health Services personnel at Level II, through to Post Graduate Diploma in Resource Management for Supply Officers. 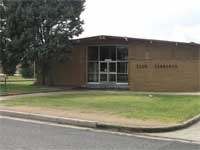 Training courses for Musicians are carried out at the Defence Force School of Music (DFSM) at Simpson Barracks, Watsonia (approx 15km north east of Melbourne and 80kms north of HMAS Cerberus). The Basic Musicians course is a self-paced course of up to 15 months duration. Although the Basic course is primarily aimed at Army trainees, the RAN utilise the for promotion courses including the Section Leader Course, Group Leader Course, Assistant Band Leader Course and the Band Officer Course. For all officers and sailors throughout the Navy, the structure of the Divisional System is in place. Members will continue to be managed and supervised by senior personnel, and will have a divisional officer who will be available for directions and instructions, provide guidance, advice, discipline and monitor well being and morale. The Wardroom at HMAS Cerberus offers a well stocked bar, reading room and TV lounge for use by all officers not under training. 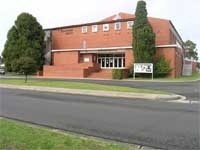 Other facilities include B-B-Q, the Aquatic Centre, Cinema, Cable TV (Foxtel), Gymnasium, Tennis and Snooker. For junior sailors, HMAS Cerberus has an excellent junior sailors mess and recreation facility, allowing all junior sailors to unwind and relax and bring civilian guests onboard. 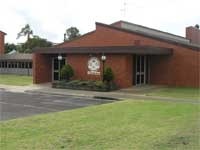 Facilities include Club CERBERUS, the Anchorage Club B-B-Q, Aquatic Centre, Cinema, Cable TV (Foxtel), Tennis, Gymnasium, Snooker, Darts and of course a well stocked bar (alcohol is not served to personnel under 18 years of age). For officers and ship's company undertaking training or posted to Cerberus, proximity of Bells beach (venue for World Surfing Championships), would entice any surfer to take their surfboard across the bay and try their luck on this world renowned break. Mornington Peninsula is also home to an abundance of boutique wineries, boasting some of the countries best emerging wines. Trainees are accommodated in three storey accommodation blocks (see above). 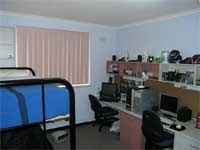 Each block has a common room with a large TV, DVD player and armchairs. Every level of the block has shared bathrooms and laundry. Cabins are comfortable and fairly spacious, and include a double bunk, desk with shelves and a wardrobe. You share toilets and showers with other members of ship's company (including females). It is a mandatory requirement that all personnel are healthy, fit and active and ready to deploy, and sport is therefore encouraged and supported throughout the fleet and establishments. The ADF is the only organisation that pays you to play sport e.g., golf, adventure training, sailing, netball, Aussie Rules and Rugby Union(just to name a few). If particularly skillful, members may be selected to play for Navy in Inter-Service competitions against Army and RAAF, and play all around Australia and possibly overseas. Sport is a popular activity for all trainees whether they're really good at it or really bad at it - everyone has a go. A variety of team sports ensure everyone has the chance to show off or learn something new and Schools and Departments play against each other regularly. 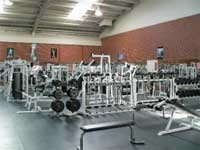 Cerberus has a modern well-equipped gymnasium, which includes weights, cardio machine such as rowing, cycling and walking machines. From time to time officers, ship's company (qualified SMN and above) and trainees will be required to undertake outside activities such as leadership expeditions, small arms training and adventure training. Personnel will also be required to undertake guard training for specific events, such as 'Navy Week' or Day. If personnel are not rostered for duty, and have no service commitments, then they can proceed 'ashore' on local evening/overnight leave. Note: If members are under 18 years of age, then they are required to return to quarters before 11.59pm. If trainees wish to travel further than Frankston or Melbourne, they must request Short Leave, which is a very simple process. Some people like to go home on weekends when they have the chance and some people prefer to stay at HMAS Cerberus simply exploring or just hanging out. HMAS Cerberus is located at Crib Point, approx 30kms from the City of Frankston, (population approaching 100,000), which offers a variety of hotels, restaurants, cafes, cinema, a large shopping complex and TAFE College. Frankston is located on Port Philip Bay, a popular holiday destination especially around Christmas and New Year. The beach and bushlands around the bay provide beautiful surrounds for walks and expeditions and activities such as horse riding, trail bike riding, canoeing, sailing, windsurfing, canoeing and kayaking are fun ways to spend the weekend. Additional maps and directions (external link) to HMAS Cerberus are available from Google Maps.